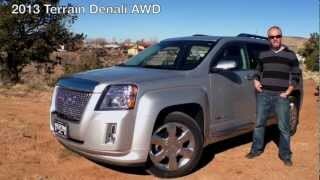 At this year's upcoming New York Auto Show, GMC is set to reveal the new Denali member, the GMC Terrain Denali 2013, a luxurious small SUV which is set to bring more power, comfort and less weight, while delivering the same fuel consumption as its predecessor. It all sounds great so let's have a look at the details. 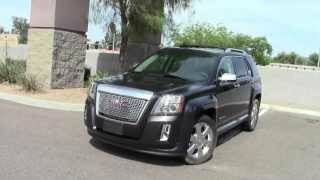 The GMC Terrain Denali 2013 will be made available with two engine versions, the Ecotec 2.4 liter DOHC I-4 DI engine and the more beefy 3.6 liter DOHC V6 DI engine. As mentioned earlier, the Terrain has been developed with fuel efficiency in mind so the 3.6 liter V6 is built using lightweight components, such as the cylinder head/exhaust manifold which supposedly saves about 13 pounds, and the intake manifold which weights roughly 5.5 pounds less compared to an aluminium intake. The V8 engine is able to develop 301 hp and 272 lb-ft of torque at 4800 rpm, whilst the more eco-friendly 2.4 liter engine will develop 182 horsepower and 172 lb-ft of torque at 4900 rpm. Furthermore, the Terrain will sport either a Hydra-matic 6T45 or a Hydra-matic 6T70 six-speed automatic gearbox in the 2.4 liter Terrain and the V8 variant respectively. The power will be sent only to the front wheels in the standard Terrain, but all-wheel drive will be available for both engines as an optional extra. The exterior of the car looks rather massive, featuring a huge front grille, big wheel arches and hulky bumpers. Some of the exterior elements, such as the exhaust outlet and grille have been enriched with chrome, and for an easier differentiation between the two engine versions, the 2.4 liter model comes with 18" rims whereas the V8 features slightly larger 19"rims. The interior of the GMC Terrain Denali 2013 has been built with luxury and comfort in mind, featuring leather covered door panels, steering wheel and eight-way seats, smoked mahogany wood trims and the soft-touch instrument panel with French stitching. Furthermore, the standard version of the Terrain -regardless of the engine type- comes with top of the line technologies such as color touch navigation featuring IntelliLink and voice commands, rear-seat entertainment system, Bluetooth and internet radio streaming apps. Additionally, the standard version is fully equipped with systems offering forward collision alerts both visually and audibly, lane departure warning and blind zone alerts. 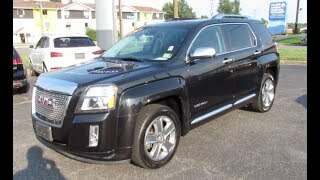 As for availability and pricing, the GMC Terrain Denali 2013 will be launched on the automotive market sometime during the third quarter of this year, but the pricing has not yet been made available. GMC will most likely shed some light on that subject during this year's New York Auto Show. 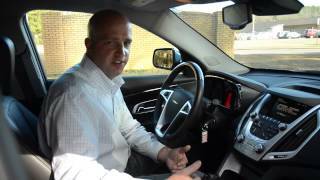 Nevertheless, the standard version of the Terrain comes with lots of built-in features and luxuries, which probably means that the GMC Terrain Denali will have a somewhat higher price tag.